Old trunks were once used as luggage or storage during times before modern suitcases were available. Typically, these trunks were made of wood and were very sturdy. 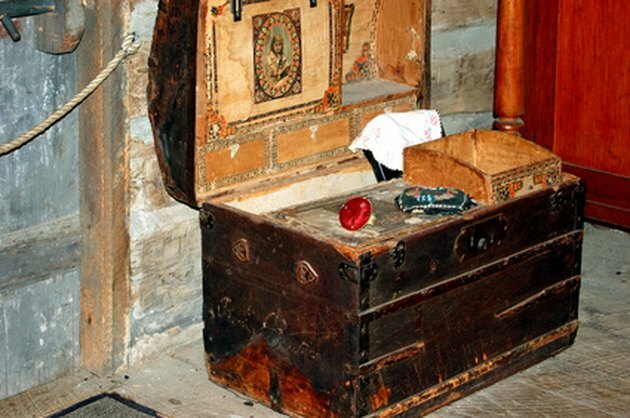 When an old antique or vintage trunk is seen, it often looks beat up, damaged and ruined. Restoring these beautiful trunks can take time and effort, but the end product is a beautiful trunk that can still be used. Trunks have been used for years as luggage and storage containers. Put protective gear on before starting. This avoids problems like dust in the eyes, breathing in wood dust or similar problems. Clean the trunk to remove all dirt, dust and grime. Dust it with a dry cloth and then use a wet cloth to wipe it down with plain water before adding furniture cleaner for additional cleaning. Exact cleaning methods will vary based on the specific cleaner. Some will spray directly onto the wood while others will be added to water. Follow the cleaning directions of the specific cleaner. Remove old finish or paint with a paint scraper. Get all of it off so that damage can be seen and restoration can take place. Look for gouges or scratches. Fill in the gouges or scratches with wood filler. Allow the wood filler to harden and dry. Remove any metal pieces on the trunk. Typically the back of the hammer can be used to remove the old nails and take off the metal pieces. Older trunks have metal reinforcements at the corners. Throw away the old nails, especially if they are rusty. Remove rust and grime from the metal using steel wool. Rinse the rust away and dry the metal completely. Sand the entire trunk. Sand along the wood grain. Move the sandpaper back and forth along the trunk until the wood is smooth. Make sure the filled in areas are sanded until even with the rest of the trunk. Use a dry cloth to dust the wood. Remove all traces of sanded wood from the trunk and make sure it is very smooth. Apply a wood finish to the wood. Paint the wood finish onto the wood along the grain and then allow it to dry. Hammer the metal back into place. New nails should be used so that the trunk is sturdy.